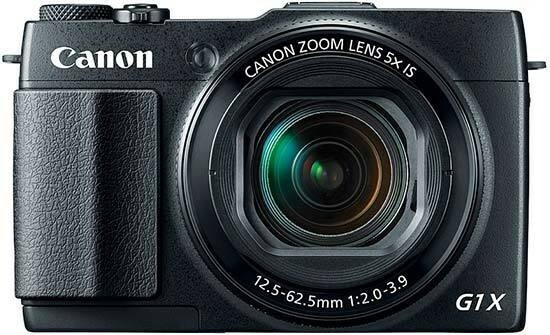 Reviews of the Canon PowerShot G1 X Mark II from around the web. There aren’t many expert compacts out there that boast both a zoom lens and a sensor bigger than 1/1.7". In fact, you can count them on just one hand: there’s the Sony RX100 and RX100 Mk II (1"), the Fujifilm X20 (2/3"), the Leica X Vario (APS-C), the Canon G1 X and the G1 X Mark II (1.5"). Canon’s new and improved version of the G1 X keeps the 14-Megapixel CMOS sensor seen in its predecessor but gets a faster (f/2-3.9) and more powerful (5x zoom, 24-120 mm) lens with an integrated lens cap, as well as two customisable control rings around the lens barrel, a new-gen Digic 6 image processor, a tilting touchscreen, a reworked interface, Wi-Fi and NFC. The optical viewfinder has also been ditched in favour of an optional electronic viewfinder accessory. Canon has clearly gone to town with its new expert compact, and that’s reflected in its ambitious price tag, as this PowerShot sells at a similar price to certain advanced DSLMs and mid-range DSLRs. Canon has no room for slip-ups here then! The Canon PowerShot G1 X Mark II ($799.99) is a camera that doesn't fit snugly into any specific category, which makes it interesting, if a bit difficult to evaluate. Its 1.5-inch image sensor is larger than you'll find in a Micro Four Thirds mirrorless camera, but a bit smaller than the APS-C chip found in SLRs and the Leica X Vario zoom, which it's similar to in terms of design, but with a lens that's physically deeper. But even with its collapsible lens, the 12.9-megapixel G1 X Mark II is a bit too bulky to fit into a pants pocket, which makes it less portable than our favorite premium zooming compact, our Editors' Choice Sony Cyber-shot DSC-RX100 II. The RX100 II keeps its place atop the heap in part due to ergonomics—the G1 X Mark II is a little awkward to hold and use—and in part because, even though its sensor is smaller, it holds its own in terms of image quality. But the Canon isn't a disappointment like the original G1 X, so it's worth a look if you're considering a large-sensor compact camera.